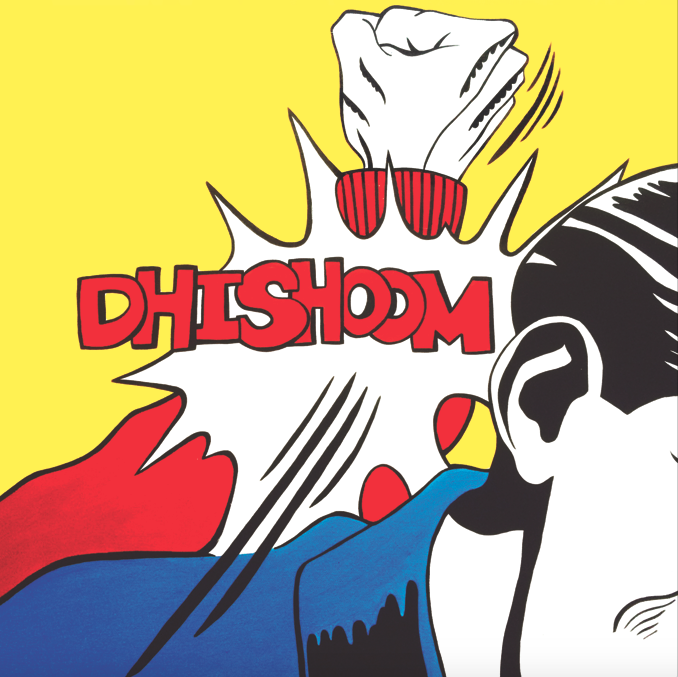 When Roy Lichtenstein first exhibited his tearful women and dramatic comic book explosions, he gave rise to a completely new school of art. And for the past 50 years, various other artists have been adopting his pop art style for their own work. 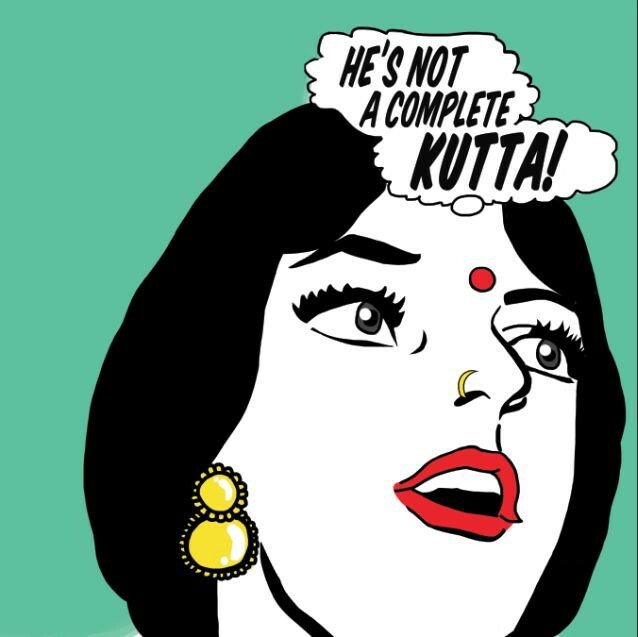 ‘Burnt the Rotis,’ as Hatecopy affectionately calls her art, is the unholy union of Indian soap operas and Lichtenstein’s pop art. Her portfolio is replete with crying women whose true fierceness is made obvious by the red of their lips, nails, and bindis. Her women are angry, wistful, romantic, and cunning. Every weakness is turned into a tongue-in-cheek strength so while she may be crying it’s only because her betrothed isn’t a Hollywood star. When I talked to Hatecopy, she told me about what it was like immigrating to Canada from Pakistan a year before 9/11. She described her adolescence as a time of rapid assimilation in which she rejected her Desi culture. But now she’s assertively taking it back. 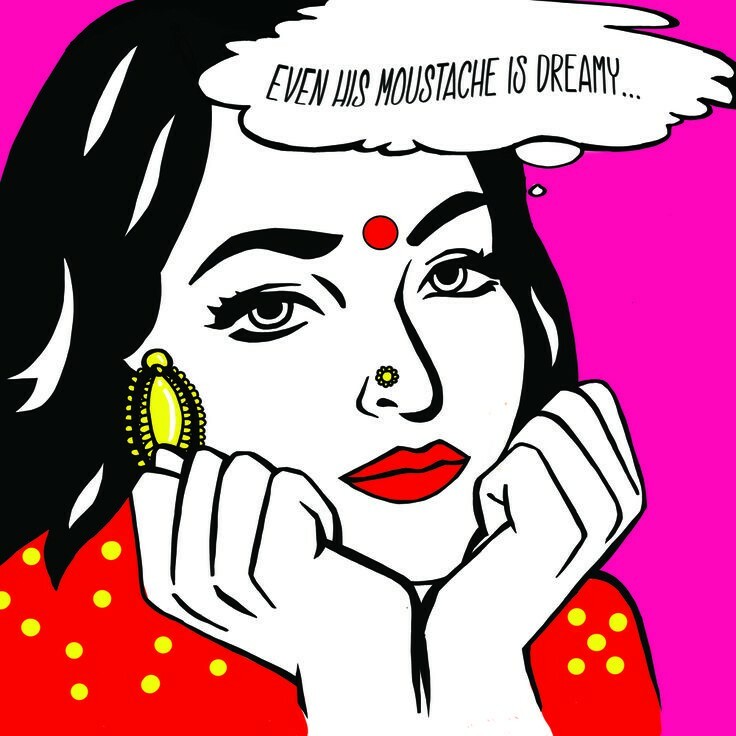 “Like, ok, we’ve learned all we can about Western culture because we’ve been forced into it so now it’s about bringing in our culture,” Hatecopy said. ‘Burnt the Rotis’ came out of a “funemployment slump,” a love for comics, and a nostalgic turn back to the hair-raising, shrilly dramatic, slap-happy soap operas she watched with her mother. The first illustration she posted, featuring the eponymous line ‘I burnt the rotis,’ began receiving positive comments. So she drew another and another. As she says, she had a lot of material to draw from. 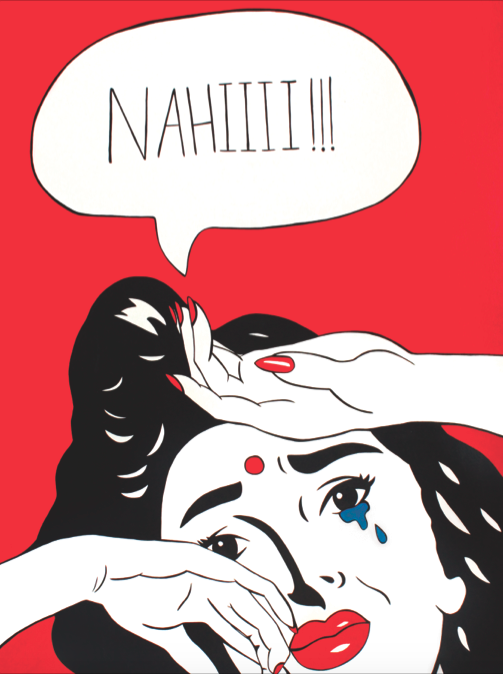 “There is such a vast amount of emotions and crying aunties [in soap operas] — I could draw all day,” Hatecopy laughed. Consistently, the series focuses on Desi women’s struggles, trivial or serious. 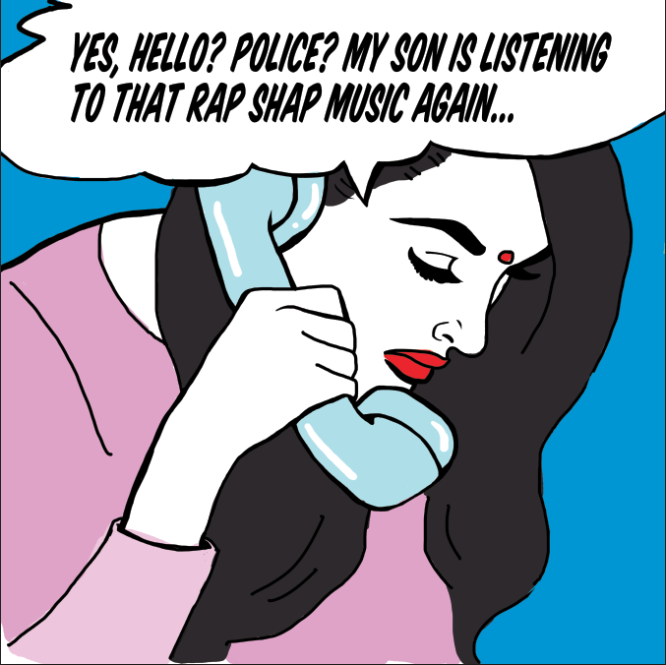 For Hatecopy, she’s illustrating “Desi situations that only Desi people would get” but in an American comic style. There is solidarity in the punch-lines of this series as well as a blending of the dual identities South Asians in the diaspora often grapple with. It provides a commentary for the mixing pot age. 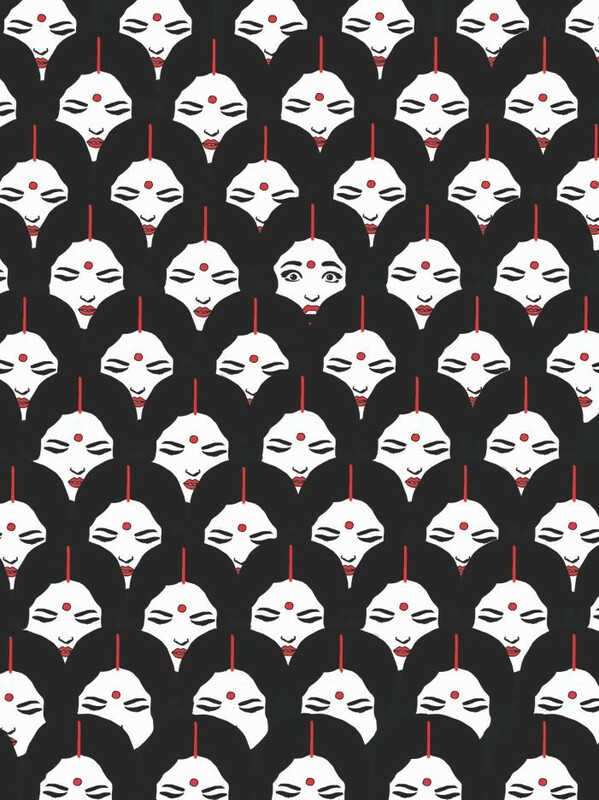 You can find Hatecopy on Instagram and purchase prints from her website.